While animals are similar to us in many ways, there is no doubt that they live their lives at a completely different pace than humans. We rush around, going to jobs, running errands, and doing general life things and they have but one goal: to survive. Even though we operate at different paces, eventually our worlds overlap. We’re all coexisting on one planet, after all. As humans, we know that highways are meant for cars, and can be dangerous to anyone trying to cross on foot. For this little sloth, however, it’s just another day in the life, and he simply has to get from one end of the highway to another. 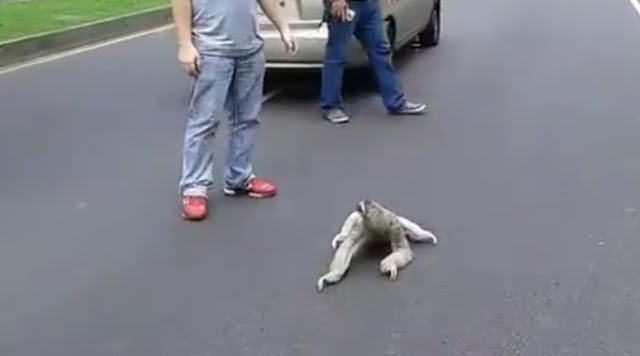 Before long, some kind folks saw the sloth and knew that, at the pace that he was crossing, he was likely to get run over. So they decided to help him out a bit! They lift him up, rush across the highway, and plant him right on a tree, where he belongs. Sloths are tropical mammals that live in Central and South America. They use their long claws to hang onto branches while they feast on the leaves that other animals can't reach. Unfortunately for the sloth, their long claws — 3 to 4 inches (8 to 10 centimeters) — make walking on the ground difficult, so they spend most of their time in the tall trees they call home. Responses to "Kind People Help a Sloth Trapped on a Busy Highway"